Copyright: The author retains full copyright in each entry. Published images by Mulafoco.org will receive proper credit. Submitted images may be used by Mulafoco.org solely for marketing and promotional purposes of this contest or future contests (for example: displaying the entries on the contest website, promotion of the contests and the photographers, cropping and re-sizing the image as necessary to fit pre-defined formats for the competition, etc.) and no other purpose. There are about 1000 categories available. Each category (made up of the theme and modality) will be awarded with a diploma of Best photograph of the year and a free inclusion in Mulafoco´s annual book Best photographers of the world. Participants awarded in two up to five categories will also receive a recognition diploma of Master of contemporary photography and participants awarded in more than five categories will receive a recognition diploma of Genius of contemporary photography. The work of these specially recognized photographers will have annual exposure in Mulafoco’s web site. There will also be a Honorable Mention Diploma for images that the jury considers remarkable. 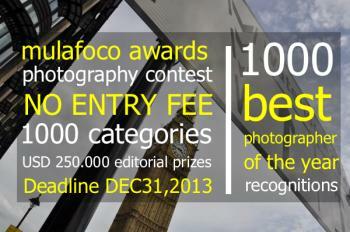 Each photographer may send up to 99 images and may participate in many categories simultaneously. Online submission of digital photographs via the website. Image requirements: JPG format; 4 MB in file size; no longer than 800 pixels on the longest side; a resolution of 300 dpi.